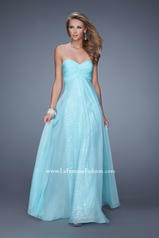 Pretty chiffon dress with a sweet heart neckline and gathered knot detail on the bust. The skirt is complete with a sequin underlay. Back zipper closure.